This is an excerpt from a student’s reflection written for Augsburg TRIO’s spring 2019 newsletter. Please see the newsletter for the original post in full. Thank you to Erika and TRIO for sharing with CGEE! 1.) Where did you study abroad? Why did you choose this location and/or program? How did you hear about the program? I studied abroad in Southern Africa and had the honor of visiting South Africa and Namibia. I chose to study abroad through the Nation-Building, Globalization, and Decolonizing the Mind in Southern Africa program because of my interest in politics. I heard about this program through the Center for Global Education & Experience and the MSS office. On February 5, 2019, Augsburg student and CGEE Central America alumni Arianna Antone-Ramirez, gave a wonderful presentation titled, “Diversifying Study Abroad” as her Gilman Project. A preview of the article can be found online. Congratulations to Ann and her great scholarly work! Join CGEE in welcoming our newest instructor, Fernanda Soto Joya, PhD, to the Augsburg campus during International Education Week 2018! Fernanda will be discussing the current political situation in Guatemala & Nicaragua – two of Augsburg’s global study center locations. Congratulations to Dr. Ann Lutterman-Aguilar, on her poster session presented at the American Academy of Colleges & Universities (AAC&U) Conference on October 12, in Seattle, Washington. 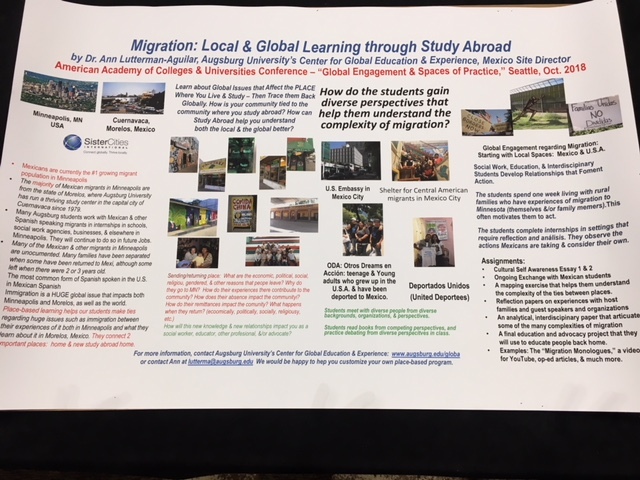 Her poster, “Migration: Local & Global Learning through Study Abroad” was featured. Will we be at your school fall 2018? Check out our traveler’s schedules below! Want to make a one-on-one appointment with us while we are in your area? 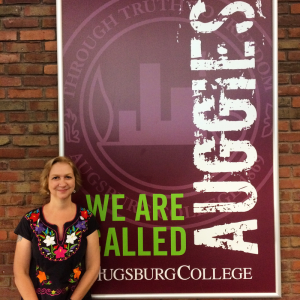 Email globaled@augsburg.edu with attention Lucy, add your school, and we’ll schedule your appointment! List of schools, alphabetical by state. Some schools may not be listed; email us to inquire if you do not see your school listed. The El Fuego Volcano in Guatemala erupted this past weekend causing 70+ fatalities and missing persons, damage to towns near the volcano, and the closing of highways and the international airport (now reopened) in Guatemala City. See recent updates as of June 6. CGEE programs and staff were not impacted by the eruption. There were no programs running at the time, and our program base is in Quetzaltenago (Xela) which is located over 100 miles from El Fuego. Augsburg University’s Center for Global Education & Experience stands in solidarity with those impacted by this tragedy. PBS has compiled a short list of organizations taking donations for the aid of the local people affected. Despite emerging indications that the government of Nicaragua may work out a peaceful resolution to the civil unrest affecting the country, we have decided to err on the side of caution and end our semester program early. Students have returned to the United States. We are working with our faculty to develop a plan that will allow students to finish the remaining three weeks of classes from the Nicaragua segment of the program through virtual means. For organizations with planned custom short-term May programs to Nicaragua, we are discussing possibilities for each on a case by case basis. While it is entirely possible that the situation in Nicaragua will improve later this week or next, making the decision to end the program early seem unnecessary, student safety—our top priority—requires us to favor current information over speculation. President Ortega has held a press conference announcing the revocation of the social security increase that triggered the street protests, and has invited the business sector and the church to a dialogue. We are not clear if this will be enough to unwind the protests in the coming days, but we are optimistic that the dialogue will bear fruit within a few weeks, restoring calm over the summer. Semester students all confirmed at their gates at the airport, awaiting flights home. Mark Lester, Site Director for CGEE Central America, is with them until all have safely left the country. CGEE staff and their families remain safe and accounted for. 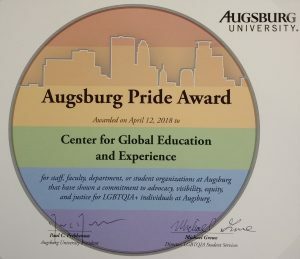 We are happy to announce that the Center for Global Education and Experience was selected as one of the recipients of the 2017-2018 Augsburg Pride Award! This award is given annually to a staff, faculty, department, and/or student organization at Augsburg that has shown a commitment to advocacy, visibility, equity, and justice for LGBTQIA+ individuals at Augsburg, and in our case, at all of our locations around that world that serve students and participants from multiple institutions! The nomination was anonymous. It described CCGE’s efforts to train its employees to be culturally competent in working with LGBTQIA+ communities. It also discussed CGEE’s efforts across its programming to provide equitable accommodations to LGBTQIA+ students and incorporate issues of gender and sexual justice in curricular and co-curricular programs. Thank you for the recognition from Augsburg and our anonymous nominator!